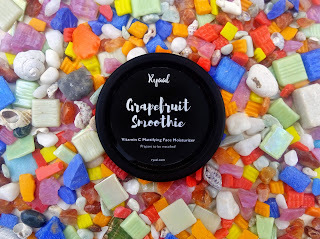 The Ryaal Grapefruit Smoothie comes in a black tub packaging. There is ingredients/product information listed on the product. Apply a pea size amount to your face while massaging in upward circles. Repeat the same for your neck. The consistency is light and it glides easily on the skin very easily. It’s light weight and absorbs without leaving a heavy or greasy feeling. It contains the goodness of grapefruit infusion, aloe vera juice, jojoba oil, coconut oil, avocado oil, rose infusion, lemon extract, cranberry extract and vitamin e.
A little goes a long way and it has a clean, subtle scent. The moisturizer is vegan, cruelty free, gluten free and paraben free.